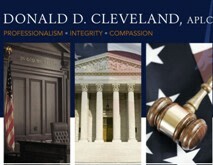 At the law firm of Donald D. Cleveland, APLC, I emphasize professionalism, integrity and compassion in my legal representation. I became a defense lawyer because I truly believe in your Constitutional right to legal representation. Contact me today. I know the importance of quality criminal defense; in fact I became an attorney and opened my own law firm to help individuals and their families through the difficult legal process when a loved one has been accused of a crime. From my Lafayette, Louisiana, office, I stand beside the accused and fight for your future. I believe everyone in this country should have access to quality criminal defense representation. I offer a free initial consultation, and I work hard to provide the best defense possible. Either call my Lafayette Parish office at 337-205-0319 or Toll Free at 888-314-0461 or send me an e-mail.